I just finished watching this movie or documentary, and I was left in admiration when it finished which urged me to share what I got out from it :). 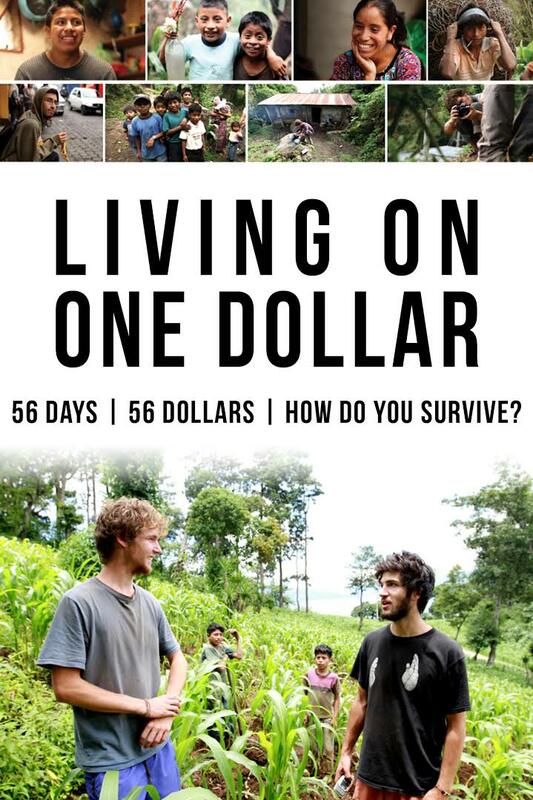 A brief description of the movie; pretty straight forward, journey of four friends ( Ryan, Zac, Sean and Chris) as they set out to live on a dollar a day for two months in Guatemala. It was an interesting experiment; they had to pay for land/ house, buy essentials, plant crops for future income and learn about different ways to survive. My initial reaction was “Oh, this will be interesting I will learn a lot about saving and survival skills.”. However, the movie left me with more than that, throughout the movie they interviewed the residents of the village, about their life, their battle to survive, their past and dreams. Which impacted me (I’ll be honest, I had couple of tears) because I live in such a free life and compare to them where every day is an unknown day, having to worry if they can eat for another day. Also, in Sydney majority of the people can get permanent jobs and opportunities, for them there is no settle or stable income (there are some but very few), which was really tough and harsh if they want to get out of poverty. It made me think how selfish and ignorant I and we can be at times, complaining and wingding for what we don’t have and ignore the blessing we have. Where we worry about what food to eat for lunch, or what should I do during weekends, people who live in poverty worry about if they can put food on a plate for their children. Another story that really touched me during the documentary (SPOILER), was the story of one the children in the village name Chino, he was twelve and very eager to learn and develop his English, during the documentary they said that Chino’s dream was to be a soccer player, but due to his circumstances he chose to be a farmer or work in the field instead. This is because education is very expensive and working in the field can give Chino financial support for his family. Chino surrendered his dream and accepted his faith, not because of his personality but his circumstances. That part was the kicked for me, the movie/documentary made me feel crap in some current areas of my life right now but at the same time it shone light, hope and encouragement for me to take on life with more energy and harder. But most importantly to be grateful, generous and always count the blessing I have within my life. There are times where we winged and complained too much of our personal life and problems. We are so engaged in our own small world, that we forget how big the world is. I am personally guilty of doing this, but I will strive to improve daily and live to the fullest with what I have. I highly recommend this movie, it reminded me of things and value I treasure and pursue, and I am sure you will reap something similar or maybe something completely different. But all I know is you will love it! 😀 That’s the way. I can’t wait to volunteer and travel in the future !! !